If you have added additional square footage to your landscape or have made recent changes to your yard, you might need to add more garden sprinklers or an additional sprinkler station. Creating a new sprinkler zone does not have to be difficult. First, measure the size and shape of the area where you are adding water sprinkler heads and draw it out on graph paper. From your measurements you can determine what type of irrigation sprinklers you need to install. The type of yard sprinkler head you install depends mainly on the size of the area where you are installing them. If you have a larger area, you will need impact heads or gear drive sprinklers. Large-sized areas are larger than 25 feet by 25 feet. Depending on the sprinkler head type you choose, they should be spaced between 15 and 45 feet apart. If your new landscape area is of medium size – less than 25 feet by 25 feet – the area will be best served by pop-up sprinkler heads. Generally, spring-loaded pop-up sprinklers come in two different varieties: fixed spray and adjustable spray. Fixed spray pattern pop-up heads come in spraying patterns such as full circle, half circle, quarter circle, center strip and side strip patterns. For adjustable spray pop-up sprinkler heads, you can easily adjust the water spray pattern from 25 degrees to 360 degrees. If you have planted a new vegetable garden or flower beds, you have several choices for garden sprinklers. You can use small area sprinkler spray heads or you can install a soaker system or dripper irrigation system for that area. Ideal sprinklers for small areas like planted areas and shrub beds are bubblers and shrub sprinklers. Mushroom bubblers and shrub heads are great for flooding areas or spot watering areas with trees, flowers and other plants. Instead of using conventional sprinkler heads for smaller areas like flower gardens or other plants, you can install a micro irrigation system or even a soaker tubing system. These types of water-conserving systems are easy to install and can easily be added to an existing lawn irrigation system in a new sprinkler zone. 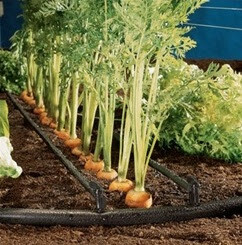 A soaker irrigation or water drip system allows you to conserve water while keeping your plants and garden areas healthy and thriving. You can easily set up this type of system on an existing water irrigation system. Once the sprinkler heads or drip system have been installed, you can connect it to your automatic sprinkler timer. On the water timer, you can easily program a new station to include watering times, durations and intervals for your new landscape area. Putting additional lawn sprinkler heads or a new dripping irrigation system with your existing garden sprinkling system can be easy and relatively quick. Since you already have the pipes or hoses set up and the rest of the irrigation system ready, adding these new components is a relatively easy do-it-yourself project. Your Orbit sprinkler system can be expanded to include additional sprinkler spray heads or even an Orbit drip system. Make the best of your existing water sprinkler system by adding more sprinklers or connecting a soaking irrigation system.